Even though virtualization has become commonplace in today's data centers, provisioning storage for applications on virtual machines (VMs) often remains a pain point for IT professionals. Random I/O processes unique to virtual environments often put a strain on storage hardware and it's common for one, or even several, VMs to eat up bandwidth, leaving others without the power they need. In addition, configuring logical unit numbers and volumes when provisioning storage for virtual environments can be extremely complicated. Today, vendors of emerging storage technologies are attempting to pave a smoother path toward better performance and capacity in virtual environments. Technologies such as hyper-converged storage aim to create a simpler configuration by shipping the hypervisor and storage in one box. Other products, deemed "software-defined storage," often pool storage to better utilize capacity and performance. But that doesn't mean managers don't still need to understand the unique set of challenges VMs place on storage. 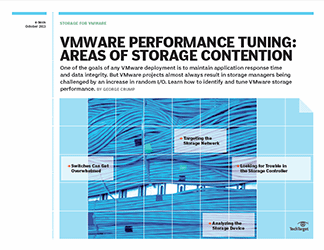 In this e-book, readers will learn how to cope with these challenges by understanding how virtualization changes the way storage should be provisioned and monitored. 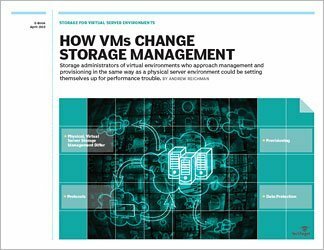 They will also learn how new technologies in the storage for virtual environment space can help and what types of applications they are most beneficial for, and how once murky technologies such as software-defined storage have grown to be more clearly defined as viable options for storing VMs. Server virtualization increases the complexity of storage management and forces administrators to pay even closer attention to issues such as available bandwidth and overprovisioning. Approaching management and provisioning in the same way as in a traditional environment could be an invitation for poor performance, wasted capacity and risky data protection techniques. Each of the major server virtualization vendors takes a slightly different approach to storage management and configuration, which might dictate aspects such as recommended protocols, feature sets and data protection schemes. But in addition to this, storage administrators must be sure to construct storage architectures based on different requirements than what they might architect in a traditional, non-virtualized environment. They need to provide an increased level of performance because virtualization multiplexes data that was once sequential together, making it more difficult to read and write. Providing fault tolerance against hardware failures is also essential to keeping virtual machines (VMs) and their applications up and running. The VM storage also must commonly support either multi-path connectivity or storage replication so that running VMs can be moved between host servers on an as-needed basis with little to no downtime. 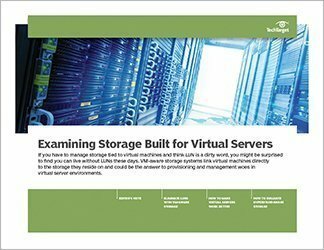 This e-book will help storage administrators plan for these requirements before architecting storage for their virtual environments. When virtual servers became popular, they also introduced a number of storage configuration problems. In many cases, virtualization required that servers for specific applications needed dedicated storage systems with different performance requirements than physical servers. Obtaining that performance often meant overprovisioning, and configuring storage separately for each workload, making for a complex environment. Luckily, a new breed of storage technologies can help reduce those problems for storage and virtualization administrators. Converged infrastructure systems and hyper-converged storage appliances make it far simpler to deploy storage for virtual machines. Converged infrastructure options provide pre-tested and sometimes pre-racked combinations of hardware and software that are set up specifically for virtual environments. Hyper-converged systems take this one step farther by providing the hypervisor, networking, servers and storage packaged in one box. IT professionals are also increasingly moving data to the public cloud to lessen the storage configuration burden. Clouds can provide the same advantages of converged storage options, but have the added benefits of scalability and sometimes cost savings. This E-book will walk storage admins through the benefits of converged, hyper-converged and cloud storage in virtual server environments to help them gain an understanding of how the infrastructure complications are still plaguing many IT professionals today. 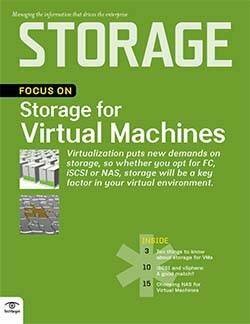 Storage virtualization can come in a number of different forms. Some might consider storage virtualization as software that acts as a control layer to pool capacity from multiple, different vendors. Others might include the several types of products that fall under the software-defined storage category in their definition of storage virtualization. Some would even argue that storage arrays that come equipped with features such as RAID or thin provisioning provide some of the same benefits of storage virtualization. Regardless of the chosen method, there are some common goals that storage virtualization can achieve -- greater scalability and more efficient management are high on that list. But when pairing storage virtualization with server virtualization, the picture gets a little less clear. Conflicting virtualization layers can waste resources if one abstraction layer masks the features of the other. Furthermore, it's possible for management to get murky if there are separate control panels for separate virtualization layers -- and that can make monitoring and troubleshooting that much more difficult. This E-book provides an overview of the most common storage virtualization technologies available today and the benefits and drawbacks of each. It will also provide a series of best practices for storage administrators who are considering the use of a storage virtualization product in their virtual server environment.